Inglis will be throwing open the gates at their Newmarket complex on Sunday 5 May for a new Syndication Open Day where prospective investors can view a parade of newly acquired yearlings that are being offered for syndication. 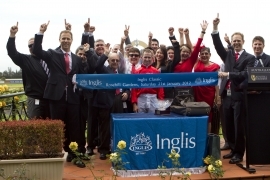 “Many professional syndicators are great supporters of Inglis’ Select Yearling Sales and we are very keen to assist them in bringing new people into the industry,” said Inglis Managing Director Mark Webster. Licensed Syndicators and Authorised Representatives that have already thrown their support behind the Open Day include Australian Bloodstock, Belhus Racing Stables, BlueBlood Thoroughbreds, Champion Thoroughbreds, Darby Racing, Dynamic Syndications, Elite Thoroughbreds, Grand Syndicates, Hunter Thoroughbred Management, Hurst Park, Ontrack Thoroughbreds, OZ Racing, Prime Thoroughbreds, Proven Thoroughbreds, Quality Thoroughbred Syndications, Slade Bloodstock, Star Thoroughbreds, Topline, Trainer Connections and Triple Crown Syndications. Gates will open at 10:30am for inspections before a New Owners Seminar under the famous Moreton Bay Figtree around 11am. Syndicators will be allocated up to 10 boxes each with select yearlings to be paraded in Inglis’ sales ring from 12noon onwards for all potential buyers to see. During the parades the syndicators will be given the opportunity to discuss the individual horses with a member of the Inglis team to all the keen onlookers. “We have had great feedback from syndicators so far and are very pleased to be offering them this additional platform to exhibit their purchases from the 2013 Australasian yearling sales,” Webster said. The bar, BBQ and Inglis Shop will be in full operation during the day, with families warmly welcomed as there will be plenty of activities available for children. More information on the event, including a list of the yearlings to be paraded, will be made available in the weeks after the 2013 Inglis Australian Easter Yearling Sale in April. If you can’t wait until May to secure a share in racehorse jump onto Bloodstock.com.au's new Syndication section www.bloodstock.com.au/syndications, Australia's leading syndication platform supported by many leading syndicators.